Really nicely done out inside, with lots of olde worlde charm and an open fire at one end. Upstairs, the dining room (with its own bar) serves no frills pub food (fish and chips, burgers, etc. -- the standard Sam Smith's menu) for reasonable prices (£5-£6 a main meal). 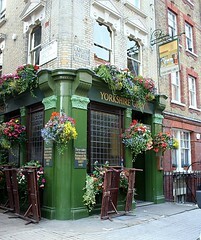 There's are three picnic-style tables in the alley alongside the pub if the weather is good, and quite often crowds of drinks can be found there in the Summer. The slightly retro-seeming Samuel Smith's drinks may take a while to get your head around, but are decent enough, especially for the price. They have Old Brewery Bitter on handpump, both upstairs and downstairs. Somewhat cramped toilets are in the basement. Last visited by elvum and a friend, 20 July 2015. Last edited 2015-07-20 20:52:01 (version 18; diff). List all versions. Page last edited 2015-07-20 20:52:01 (version 18).